Julienning vegetables is a simple but elegant restaurant-style presentation that requires only basic knife skills. 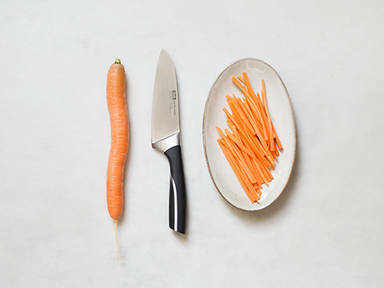 The most important part of safely executing this technique is to create a secure, flat base for your vegetable to rest on while you slice; to create the base, simply slice off a thin layer of one of the vegetable's rounded sides. If you are preparing a long or large vegetable, like a carrot, you'll want to cut it at least in half for the sake of ease--when it comes to chopping and eating. From there, thinly slice the vegetable lengthwise, then cut those slices into thin strips, like matchsticks. What Else Can You Julienne? It's easy to julienne herbs, like basil, or even crêpes. Simply stack the leaves or crêpes, then roll them up like a carpet. Slice the roll horizontally across the short end, then unfurl the leaves to sprinkle over your dish.